Making New Year’s resolutions at New Year’s is counter-intuitive. The start of the year is in the dead of winter, when levels of motivation match the sub-zero temperatures. It’s hard enough to find the drive to get out of bed and into work every day. There’s practically no energy left over to tackle those ambitious ideas about tackling odd jobs, learning how to play guitar, and getting into shape. You might as well just not make resolutions at all for all that you’ll get done when the Canadian weather’s at its worst. The springtime, on the other hand, is the ideal point in the year to break old habits and start new ones. The sun’s finally shining, the breeze is warm, and the mercury’s climbing up to the double digits again. All very welcome after a long time spent indoors, and the Earth’s renewal is infectious. You can’t help but feel ready to get out of your funk and start doing stuff again. Congratulations, you’ve got spring fever. It’s not just in your head. It may very well be a biological response to the change of seasons. As spring heralds longer days and warmer temperatures, the increase in sunlight affects the hormones our brains produce. One such hormone is melatonin which is the chemical responsible for your circadian rhythm, or the cycle of sleep and wakefulness. Increases of this hormone can improve your mood and is the reason why you’re feeling ready to take on the world this spring. Many of your fellow Canadians will be channelling that extra energy into tidying their homes in their annual spring cleaning. But that isn’t much of a resolution, now is it? Besides which, you keep your house in a pretty good repair all year round. Why waste this motivation on something as boring as household chores? Now is the perfect time to pick up where your apathy left off way back in January. 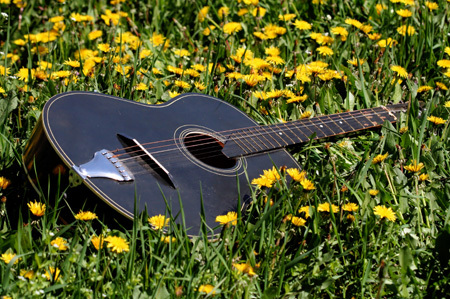 It’s time to finally do what you had set out to do and learn how to play the guitar. Like any other goal, once you’ve committed to it, it’s a good idea to create a supportive network to help you attain your target. This doesn’t have to be fancy. Your support group can be as small as the one music teacher you choose to help you learn this new instrument. A talented instructor can help you keep your studies on track by providing helpful tips and techniques as you familiarize yourself with the frets, strings, and musical notes in general. Enrolling in guitar lessons is simple especially if you’re already on your way to your local music store in order to get a guitar. Many first timers love the ease of a Fender guitar, but it’s a good idea to ask for help. The knowledgeable sales representatives at Long & McQuade can answer any of your questions regarding musical instruments and music lessons. With over 60 locations across the country, there’s bound to be one near you. You can find your local Long & McQuade store by checking out their website and inputting your postal code. Wherever you go, follow the advice of the experienced staff behind the counter. Not only will they help you find an affordable, well-made guitar but they’ll help you choose a qualified instructor. With a brand new guitar and beginner guitar lessons in your future, you’ll finally be able to cross off learning this particular instrument from your list. So take advantage of spring fever’s motivation and the influence of increased melatonin and take on your resolutions 5 months late!